People are always on the lookout for the "next big thing" for better health. Chia seeds, coconut oil and even bone broth have all enjoyed a great fan-following, but now there's something new. It's apple cider vinegar (ACV). While you may already know that apple cider vinegar has some health benefits, you may not know how beneficial it can be when consumed in the morning. Why Should We Drink Apple Cider Vinegar in the Morning? Apple cider vinegar has been used in different forms for centuries. It offers numerous health benefits when consumed in the morning. Add a tablespoon of ACV to a glass of water and drink it before breakfast or each meal to improve digestion. Be sure to use unpasteurized, raw vinegar with the mother to receive maximum health benefits. The mother refers to the cloudy strings of pectin and proteins which are naturally produced during fermentation. Only raw ACV has the enzymes and nutritional properties to stimulate the production of your digestive juices to improve digestion. It also contains pectin that lowers LDL cholesterol and acetic acid that help your body burn fat more efficiently. What's more, it has antiviral malic acid. Drink it regularly before your main meal to reduce hunger, lose weight, and soothe the entire gastrointestinal tract, which prevents bloating, stomach cramps and gas. It will help maintain the balance of good bacteria in your gut because of its antibacterial, antifungal and antimicrobial properties which are gotten from malic acid and acetic acid. It also plays a role in limiting the growth of the candida fungus in your intestines. ACV promotes healthy gut flora, which, in turn, helps improve your immune system. Drinking it daily will also break up mucus and cleanse lymph nodes to benefit your lymphatic system. Drinking apple cider vinegar in the morning may also help regulate blood sugar levels by slowing down the digestion of carbohydrates. Several studies show that ACV can improve sensitivity in insulin resistant individuals and has physiological effects quite similar to metformin or acarbose. Many people who have been drinking ACV for quite some time have managed to lower their blood pressure to some extent. Studies say that ACV can increase nitric oxide production that, in turn, relaxes your blood vessels and lowers blood pressure. It is good for your cardiovascular health, so it may also help lower your blood pressure over time. Drinking apple cider vinegar in the morning is great for detoxification. Add a tablespoon of ACV in a glass of water and have it before each meal. Do this regularly to help cleanse your liver and detoxify your body. Apple cider vinegar is rich in acetic acid that helps in weight loss by suppressing the buildup of liver lipids and body fat. Pectin in apple cider vinegar also plays a role in reducing your body's ability to absorb fat. Drinking it in the morning will improve digestion, which will reduce your hunger levels and help you achieve your weight loss goals. Add a tablespoon of ACV in a glass of water and drink before each meal to see results in a few weeks. Including an ACV drink in your routine will also help improve your skin from the inside. It works as a skin tonic and improves your skin's pH balance. It also proves quite beneficial in treating conditions like acne. Apply it externally as well to treat certain dermatological conditions. As a good health tonic, raw and unpasteurized ACV improves your stamina and energy when consumed regularly because of its powerful alkalizing effects on your body, which is beneficial against acidosis and helps treat many health conditions. Drinking apple cider vinegar in the morning works wonders for those who have failed to receive any benefits from teeth brushing and mouthwashes. Simply add some ACV to water and gargle with it. Drinking it helps eliminate odor-causing bacteria. Regular use of this solution also helps remove stains, kill bacteria and whiten your teeth. You may have gathered the fact that apple cider vinegar offers a number of health benefits, but the list isn't over yet. 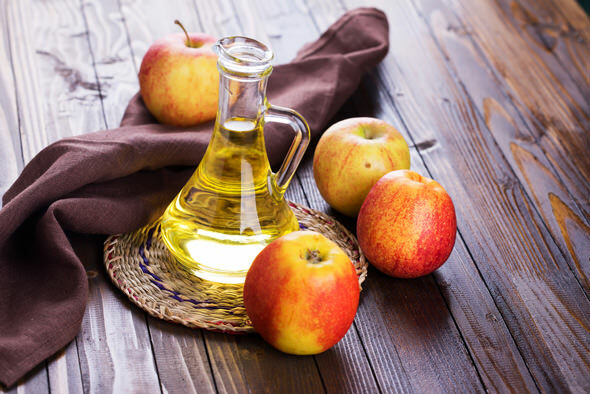 Here are some other interesting benefits of using apple cider vinegar in morning. Cure hiccups: Apple cider vinegar has a sour taste that may prove helpful in stopping a hiccup. Just take a teaspoonful of ACV whenever you have hiccups. Alleviate sore throat: Consume apple cider vinegar as soon as you notice your throat becoming irritated. ACV can clear infections because it creates an acidic environment that's not suitable for most germs to survive. Simply make a mixture by adding ¼ ACV to ¼ cup warm water and gargle with it every hour. Clear a stuffy nose: Apple cider vinegar contains potassium that clears mucus and cures your stuffy nose. Add a teaspoon of apple cider vinegar to a glass of water and drink it regularly to prevent nasal congestion. Soothe leg cramps: Leg cramps usually indicate your body needs more potassium, and apple cider vinegar is a great source of it. Make a mixture by adding a couple of tablespoons of ACV to a teaspoon of honey. Drink it regularly to prevent nighttime leg cramps.